See our range of belay devices here. The modern belay device is an absolute must for every rock climber’s rack of gear. Their general purpose is to allow for friction to be applied to a rope to prevent a climber from falling, or to abseil smoothly down a sheer face. They have simply become indispensable, replacing centuries old techniques – one of which included running the rope behind the belayer’s back and holding on for dear life! But the array of devices on the market these days can be bewildering. Do I need a device that can accommodate two ropes at the same time? Or one with teeth for extra friction? How about one with an extra loop that allows it to auto-block? 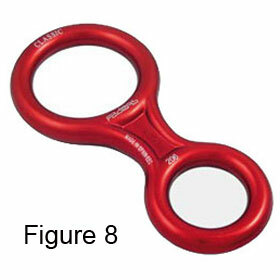 And what about the classic figure eight device like the one I used on school camp? The answers to these questions, and many more, can be found below. Most simply, a belay device must generate enough friction on a rope to slow or stop a climber or abseiler. As the rope passes through the device it is forced to run over at least one edge in a tight bend, which is where the friction is generated. Remember: the tighter the bend, the greater the holding power. The tightness of the bend is controlled by the belayer’s ‘brake hand’ on the ‘brake end’ of the rope. The device is then usually clipped to the harness with a locking carabiner, often through a dedicated loop or hole on the device. Sometimes called aperture devices, these are also made from an aluminium alloy that is lightweight and durable (Quick note: A common name for these devices is the ATC, or Air Traffic Controller, but this is just the name of the first model to hit the market, produced by Black Diamond). There are two features which almost all tubular belay devices will contain. The first is a loop on the underside of the device, often a thin metal cable protected by a plastic sheath, through which a locking carabiner is clipped. This prevents the device from becoming jammed up against the users harness or from sliding away up the rope and out of reach. The second feature is having two apertures (holes) to accommodate two bites of rope. This can be essential when abseiling as often two strands of rope will be hanging down the intended abseil line. 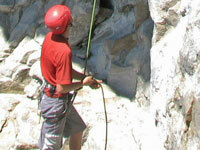 Both strands must pass through a belay device in order to abseil. The rope can then simply be pulled down after the abseiler safely reaches the ground. A few, such as the DMM Bug, are symmetrical which allow the brake end of the rope to run equally over either side. In other words, you can’t put the rope in backwards, which keeps Murphy’s Law at bay. Other devices, such as Wild County’s Variable Controller, have two modes for the discerning belayer. One side is thinner, allowing a tighter bend in the brake end of the rope to be made, creating more friction. This could be helpful if a lightweight person is belaying a heavy climber for example. The other side of the device is thicker which allows the rope to run more smoothly through the device while still being able to generate sufficient friction to halt the rope if required. This generates a smoother and quicker abseiling experience. Some devices have one popular additional feature: teeth. These are located inside a V-shaped groove on the high friction side of the device, allowing even greater friction to be generated. This can be especially handy if the climber is going to ‘hang-dog’ the route (often when reaching climber’s upper difficulty limit they will dangle on the rope half way up the climb, resting and contemplating their next move). They are small and lightweight and can accommodate two lines of rope. They are also relatively cheap and are easy to use. One minor drawback to tubular devices is encountered when lightweight people need to abseil a long distance, say over 10 metres. There can be too much friction due to the heavy weight of the rope hanging below the abseiler, which effectively puts pressure on the braking side of the belay device. However, this effect will reduce as the abseiler makes their way down the line. They are predominantly used by rock climbers and mountaineers, but seeing as they are such a simple and versatile device they are widely used across all roped activities. 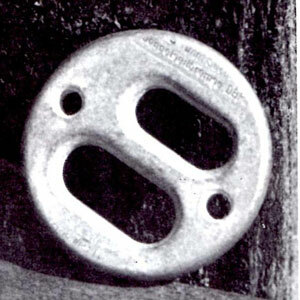 The ‘sticht plate’ would fall into the aperture devices category except for the lack of the loop on the underside (some later models did contain a spring in place of the modern loop). Climbers would tie a thin cord to the plate which they would then clip to their harnesses, effectively accomplishing the same result. It was the first aperture device on the market in the early 70’s, and had a plate design instead of the modern tubular design. It was certainly very popular for a several decades but now can only be viewed as a historical stepping stone which has been entirely superseded by modern belay devices. Also called self-blocking, these have an extra mode of use that has gained much popularity in recent times, helped in part to the popular Petzl Reverso. In addition to the standard belaying modes of simpler aperture devices, two extra loops of metal have been added to the side, allowing for an additional belaying mode. This allows the device to self-block and catch a falling climber. It must be stressed, though, that the belayer still needs to have a hand on the brake end of the rope to help initiate the braking. It can only be used in this mode by a leader belaying from the top of the route, but can accommodate one or two climbers at a time. This is a common situation for a rock climbing guide to be in, and hence why this feature is sometimes referred to as ‘guide mode’. It also allows the belayer a greater degree of freedom from the anchor setup, escaping being tied directly to the anchor themselves. One product in this category worth mentioning is the recently released DMM Pivot. It is in many ways very similar to the Petzl Reverso, although that’s not too surprising since the Reverso is manufactured in DMM’s factory in Wales. The Pivot’s primary difference is the addition of a pivoting loop which, when a climber weights the rope whilst in guide mode, allows the tension to be more easily released. They are even more versatile than the standard aperture devices, whilst still relatively lightweight. The significant advantages of the auto-blocking mode are not easily dismissed either. They are more expensive than the standard devices, as well as being a touch heavier and bulkier. You don’t need to be a professional guide to benefit from the auto-blocking mode. Anyone who lead climbs outdoors has the potential to utilise this feature and, as such, this category of belay device is quickly becoming the most popular with climbers. And, as with the standard devices, these devices can be used in all roped activities due to their versatility. 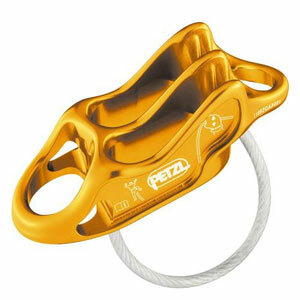 The most expensive category and also the most complex are the camming devices, such as the Petzl GriGri. These devices contain a spring loaded cam, made of stainless steel, which allows the rope to run freely in one direction but will grab and hold tight if a force is loaded in the opposite direction. Once loaded, the cam can be gently unweighted via the use of a fold out handle, allowing a climber to abseil with great control. The cam also works as a fail-safe should their hands slip off the rope or device. So, effectively they function as a standard friction device but with an assisted brake. The spring-loaded cam allows for easy the rope to be held quickly and securely during an abseil, top-roping or sport climbing. Also the hands free fail-safe is great for some peace of mind. Before we get too excited and rush out to buy one of these marvels there are some genuine limitations to them. Firstly, they can only accommodate a single line of rope at a time, which limits their function as an abseiling device. Secondly, they have a tight range of rope diameters (although improved from older models) for which they are optimised – for example, 9.4mm to 10.3mm for the Petzl GriGri. Next, in lead climbing scenarios where rope needs to be paid out quickly (to the leader when clipping, for example) the cam can gets in the way and can create some dangerous situations. Due to the very quick response of the camming mechanism they can catch the rope quite abruptly which will generate more force on anchor points. 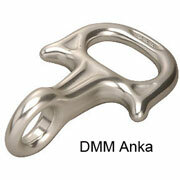 They are still popularly used on sports climbs, but a good amount of experience with them is recommended. They can also be quite heavy and costly which doesn’t make them ideal for a first device. Lastly, no device is fool proof and the ‘assisted braking’ is just that – one hand should always be left on the brake rope. Users: These devices excel for people who predominantly sport climb, top-roped climb, abseil (on a single line) or ascend a fixed line. These metallic devices are shaped like the numeral eight, and are typically made from a lightweight aluminium alloy. They require a bight of rope to be pushed through the larger hole before being looped over the smaller and then clipping the smaller hole to your harness with a carabiner. This creates two bends in the rope which, as the rope runs through the device, generates the friction. The rope feeds through these devices very smoothly which reduces friction which in turn reduces wear on the rope. They also tend to dissipate heat (caused from friction with the rope) more easily than other smaller devices. 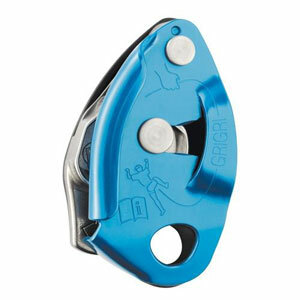 Compared with the other categories of belay devices, they are large and heavy, put a twist in the rope (which leads to pig tailing and other rope twisting issues), as well as not enabling a lock off strong enough to catch a falling leader without a lot of rope slippage, and so are not a good option for climbers. There have been some improvements of recent times, like the DMM Anka, that have an improved geometry which effectively decreases the twisting of the rope, as well as improving the force that someone can generate on the brake end. 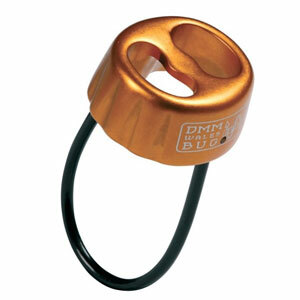 They are most commonly used by cavers, commercial abseiling companies and search and rescue teams. If this is your first time venturing into the world of climbing and you simply require a friction device to get you out climbing, then a basic aperture device will be best for you. If you plan on being a little more adventurous, or at least hope to be attempting more adventurous climbing in the next few years, then an aperture device with teeth and/or with guide mode may be more suitable. If abseiling is the name of the game, then a figure eight could be the way forward. If you like idea of hanging for long periods during a sports climb or an abseil (on a single line) or you would like some extra redundancy whilst top roping then an self-braking spring-loaded device might just be the bit of kit that you’re looking for. If you still have any queries feel free to drop by the shop or give us a call. Just be sure that before you take any belay device out to the crag that you obtain proper instruction in their correct use. To see our full range of belay devices and roping devices, ascenders and descenders click here. I have read your article, really nice information you have shared about rock climbing. I want to share a resort website for the Australia tourists.